In your interactions with other people, do you always get the result you’d intended? If the first part of Self-Awareness is getting really clear about your Intention (see this article here), then the second, perhaps even more important part is to practice noticing your Impact in the form of the Result that you got. What happens when you interact with someone else; and was it what you meant to have happen? It’s tough rule to follow because it’s telling us that, no-matter what we said or did with someone, no matter what our intention was at the outset; what we actually communicated was exactly what the other person says it was – even if their interpretation or response was radically different from what we meant! It is the meaning that they ascribe to your communication that counts, not yours. Of course, this rule is only important if you want to have really effective interactions and communications with other people. If not, if you’re happy to say, “Well, I don’t care what they actually did in response, I told them what I wanted to tell them anyway,” then this rule doesn’t need to apply to you. There are lots of communication skills that you can use to maximise your chances of making sure that the message and meaning you meant to communicate is what somebody else actually hears. When you say something to people, are they hearing what you meant them to hear – and how do you know? When you do something for somebody else, do they understand why you did it, and again, how would you know? Awareness really is the key here. Most of the other skills are about saying or doing things in a slightly different way, often to better match the other person’s style, and with a bit of experimentation almost everybody can broaden their range and learn to match it to other people. But you won’t even know to do that if you’re not monitoring the Impact you’re having. So that’s the Self-Awareness skill that I’d like you to practice next. It’s the red box in the diagram above. Did your interaction with another person get the Result that you Intended – and how do you know? 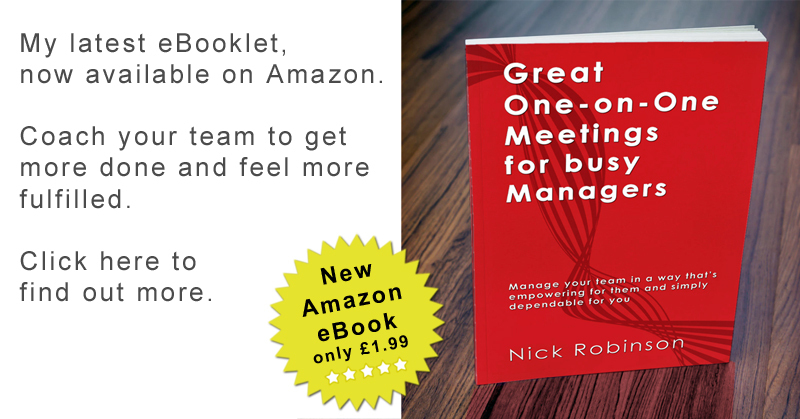 As usual, please leave me a comment if they’re still open below, or tweet me @NickRobCoach to let me know how your Self-Awareness is doing and how you monitor the results you get from your interactions with others. If you want to adopt ways of thinking and behaving that get great results and satisfaction (to empower yourself), or to help other people to do the same, here’s the third article in my series which looks at what we call ‘Empowering Beliefs’. These are the unconscious thought processes that can either really help or really hinder us. This part is about how we can selectively focus and filter our attention towards the ways of thinking that empower us. An immediate side-benefit of this kind of approach is that it tends to crowd out or silence some of that self-doubt that can otherwise creep in and undermine us. d) Lastly, because it works in steps and helps direct our focus in a positive way towards what we want, you can use this process, pretty much as it’s written here with other people, whenever you want to help them to empower themselves. Here’s how you can use this approach. What do I want to be able to do? And let’s call your answer to that question the [Ability]. I’ll put it in square brackets like that below as well, so you can track through what’s going on. When I’m [doing Ability], what’s important to me? And I’m going to call your answer to that question the [Criteria] because it reveals how you’ll judge whether you’ve got that ability. Now we’re starting to get a real handle on what is wanted and to reveal the way that this person wants to approach having it. To continue the example from above, I asked my client, “When you’re concentrating, what’s important to you?” And the answer came back, “That I’m working through until it’s finished.” So that’s how he’ll judge whether or not he’s concentrating – is he working through until it’s finished. I could also have asked what does it mean to ‘work through until its finished’, or something like that. The crucial things are to (a) use the same words as him and not paraphrase; and (b) just to start getting more and more meaning and definition. What we’re doing here is taking a desired capability, an ’empowerment’ out of the vague and unconscious and into the real world. That’s where the power is in this work. The last step in this part of the empowering beliefs process, is to get as concrete and real as possible about what kind evidence we want our minds to be scanning for. It’s almost like we’re programming ourselves to put aside doubts, fears and fantasy, and to start getting real. What do I see, hear or feel when I’m [Criteria]? I’m going to call your answer to that, the [Evidence]. After you’ve gone through steps 1-4 above, that’s often enough to shift things quite some way towards having that ability or capability or attitude of mind. My client who wanted the ability to concentrate, which meant working though until it’s finished, was able to use the evidence part as a kind of series of signposts to help him concentrate. Now I know that the [Ability] I want is about [Criteria] and that I’ll recognise it from [the Evidence], what are the next steps I might take to empower myself? Try some of this for yourself. Think of an ability, a capability, or an attitude of mind that you’d like to have, and track it through the steps above. Let me know how you get on please. Self-Awareness is the best start for leadership development. But how do you get that? What should you look for; and how? 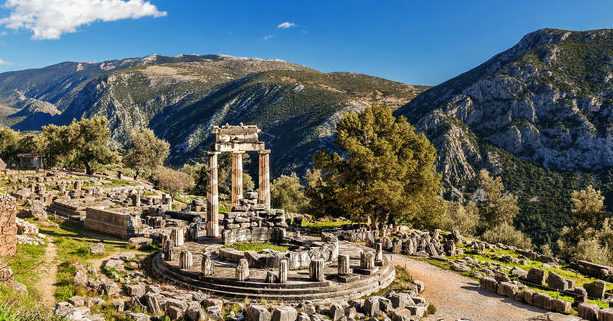 The ancient Greeks had the phrase “Know thyself” chiselled on the doorway to the temple of Apollo at Delphi. Real knowledge, insight and understanding about important events and people in the world around them wasn’t possible they reckoned, without first having the foundation of self-knowledge. If that’s still true today, how do you actually go about getting self-awareness? What should you look for; and how do you do it? I think there’s perhaps three or more important areas to consider and I’ve set out some of those below. These are often used as early as the second or third phase in my coaching approach, as they’re so fundamental to the development work we need to do after that. This is a fairly long post for me, over 1,200 words, because I wanted to give you a rounded sense of where to be looking, what to be listening for and how it feels to be embarking, in a structured way, on this kind of self-knowledge work. What I’ve written here isn’t the only way to go about it, and even at over 1,200 words this is still only a very quick jog around the park. Anyway, I hope you find it helpful in some way. Note that these are in ‘strings’ of words, separated by “/” because often one word by itself isn’t enough to capture everything about a particular value. A simple way to start to uncover your own values would be to remember a time, at work or at home, when things felt like they were going great, or just right, or were especially poignant in some way. What were the circumstances of that time? What was going on around you, who was present, how did you feel? The chances are that during that time several of your values were being quite strongly upheld. People can often begin to identify those values by reflecting on that time and getting curious about what made it so great for them. This is about how your (mostly unconscious) mind filters out what is useful information and what isn’t and how it then represents that information, so that you can make sense of the world around you. Since this process happens very fast and mostly unconsciously, one of the best ways to uncover your own patterns is by way of a kind of compare and contrast with other people. Look at the way they do things, and see how it compares with your own way. Are you motivated into action more by (a) the chance to achieve a goal; or (b) the need to solve or avoid a problem? Do you prefer (a) to have lots of choice and variety, creating different possibilities in the way you go about things, or (b) do you prefer to stick to a tried and tested process? Another important pattern became obvious to me when I got a new Satnav. My old one used to show me a map of my whole route when it had finished plotting. Only after you’d seen that ‘big picture’ screen, did it let you start navigating. But my new satnav didn’t give you that overview. Once it’d plotted a route, it just went straight to “Turn left”. I really found it difficult to trust the new satnav and would often ask my wife to just check the ‘big picture’ of the route in our tatty old road atlas, which she hated doing. Turns out, I’ve got a strong preference for thinking in big picture terms and, until I’ve done that, it’s really hard for me to get into the detail, even though I’ve trained myself (I’m an ex-accountant!) to work with detail. And my wife is the opposite, she’s fascinated by the detail, so she hated being asked to check the big picture of the route. Again, these factors are not immutable, they can change and be changed. It’s important to not ‘adopt’ them as fixed determinants and to not use them to pigeonhole yourself or others, or to excuse bad behaviour. It’s possible, although I don’t think it’s often that necessary, to go through about 20 or so of those key patterns as part of the coaching process in in easy conversational way with me. I don’t often do that, because I’d rather people take responsibility for their own self-knowledge than have me or some anonymous psychometric test do it for them. What holds you back? What doubts do you have about yourself, your abilities, the kind of person you are, the way others might see you? What things are you so unconsciously afraid of, that you’ll automatically come out fighting, even when that isn’t the best way to do things? In what way do you sell yourself short? Or sabotage your own efforts? What unwritten rules have you made up about how you have to “be” (e.g. a favourite of mine: “I have to be strong”)? What shame or hurt are you carrying around about past experiences that made you feel inadequate? I love working with fears, doubts and limiting beliefs because I see them not as ‘bad’ things, but as really useful data about what’s important to people and about how they might really shine, if they want to. If you find anything at all, start celebrating, because that just might be the bit of self-knowledge that opens all the other doors. And if completing the sentences didn’t uncover anything for you, just try going back to those questions I’ve posed at the start of section 3 above and become curious about how any of those might apply to you. After working through those three key areas, the next level of self-knowledge is to get really clear about what’s even more important to you than your patterns of thinking and your doubts and fears and about how you might apply your values to your life and your work. How do you make people feel? The importance of Intention in our interactions and four key hints for leaders who want better Impact. As a leader, manager, colleague or supplier to other people, the personal impact that you have on others is perhaps the single biggest determinant of the quality of your relationship with them. And it’s that relationship which will make or break the success of what you’re trying to achieve. Result. What outcome did we actually get (which might be different from our intention). For great self-awareness, we need to be conscious of both of these aspects of our impact on others. This article is going to look at 1. Intention, and I’ll cover 2. Result in a later article here. I like to break it down into those two steps because we’re often operating on a kind of autopilot when it comes to our interactions with others. But the issue here is that you can’t not have an impact on another person. They WILL notice how you made them feel, even if it was that you made them feel nothing. If your relationship is a purely transactional one, no emotional content, no ongoing interactions likely, no need to trade favours or if they’ve no choice about helping you, then I suppose you could safely skip all of this stage. But how many purely transactional relationships can you actually think of? For most of us, and I would argue most of the time, the personal impact that we have on someone, even when we’re just asking for a task to be done, is hugely important to getting those things done well. So be very clear about what your intention is before you start an interaction, or before you respond to one. Sometimes leaders need a bit of a framework for their personal interactions. Below you’ll find my simplified cheat-sheet for the kind of impacts that leaders should be looking to create whenever they have an interaction with someone. to have them be empowered and be growing. How about you, what impact do you intentionally want to have in your next interaction? The best starting point for any development and growth at work, whether as a leader, a team member or just as your individual self, is the place of “self-awareness”. And I’m talking here of self-awareness in a wide sense. If you’re looking at self-awareness just as an emotional intelligence tool, then you’ll be focussed too narrowly, just on the awareness of your own feelings. What I want you to get, is a self-awareness about the whole you. That’ll include your drives, flaws, experiences, ambitions, assumptions, patterns of behaviour, values, resourcefulness and more. But also, and maybe more importantly, the big picture of what it’s like to be you. And what’s it like to experience who you are. This kind of deep self-awareness really is essential to any kind of development. It’ll answer questions right down at a tactical level about what you want to be doing with your time and effort and how best to interact with the world. And it’ll act as a kind of beacon, keeping you heading towards the more important, bigger picture of what you’re about. Sometimes this kind of self-awareness is forced upon us when something we’re trying to achieve goes wrong. Then we have to re-assess things on a personal level. And at other times, self-awareness comes out of a ‘gap’, a sense that something’s missing or unfulfilled. Overcoming the uneasiness and discomfort around this kind of self-knowledge is important both to make sense of what’s happened so far and to move forward. If you wanted to get some more self-awareness without being forced into it by that kind of circumstance, how would you go about it? One of the best ways is to pretend to be your own observer. First, imagine ‘seeing’ a version of yourself. Get a sense of who this person is, and what’s important to them. Second, imagine you could observe how this person goes about interacting with the world about them and with other people. There are many things you could be observing and getting a sense of, but to get you started here’s some of the things I’ll typically be asking my clients about to help them develop their self-awareness. We talk about them as if they were another person, so instead of saying “what’s important to you”, I’ll get them to practice being an impartial observer of themselves by asking, “what’s important to this person?”. What kind of things are really important to this person? What’s the story of how they got to where they are today? And what did they have to overcome, sacrifice or achieve to get here? What are they like, at their absolute best? What qualities do they have that make them a resourceful person? What personal attributes, skills and knowledge can they call upon? What holds them back or keeps them stuck? As they interact with the world, how clear are they about what outcomes they want? Thinking of a specific interaction that you want to understand more about, what was their intention at the outset? Did what they wanted to have happen, actually happen? How wide is the range of choices they have about how they approach things; do they have one typical way of operating or a wider range? What are some of the assumptions, hidden beliefs or ‘rules’ that they have about the world, about themselves and about others?